With education and knowledge knowing no boundaries, a government primary school in village Sadda Singh Wala of Mansa district in Punjab has established a mathematics park for students in Savitribai Phule's memory with her life-size statue installed in it. The inspiring story of Savitribai Phule, who along with her husband had opened country’s first school for girls in 1848 at Bhide Wada in Pune of Maharashtra under the British Raj, has got a befitting tribute at a place no one would have really expected. 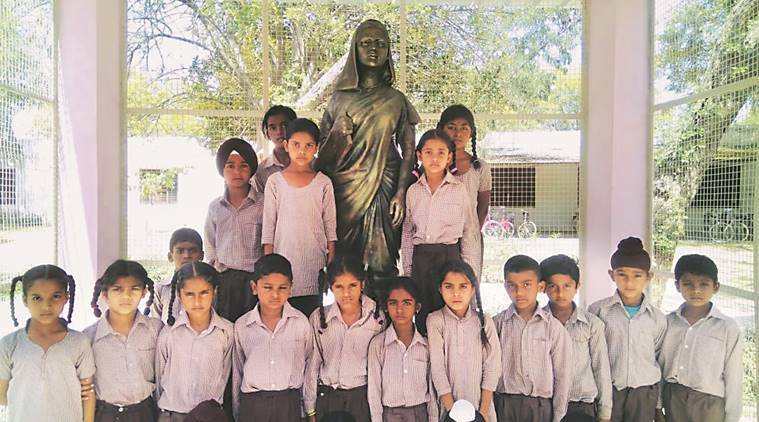 With education and knowledge knowing no boundaries, a government primary school in village Sadda Singh Wala of Mansa district in Punjab has established a mathematics park for students in her memory with her life-size statue installed in it. “Savitribai Phule Yaadgari Park’ (Savitri Bhai Phule Memorial Park), reads the board at the entrance and inside is a 5 feet 7 inches tall statue of Phule installed in fiber. Clad in saree tied in Maharashtrian style and a plaque installed nearby narrating her life story, not everyone in Punjab might connect with the personality at first glance. But according to the school head teacher Amolak Singh, that is what the motive behind the initiative is, to tell people living in Punjab about the woman who stood for girl education, Dalit rights, widow remarriage and fought against child marriages, caste-ism and other issues. The board near the statue titled ‘Why There Is A Need to Remember Savitribai Phule?’ narrates her life in Punjabi language. Born in 1831 and married at age of just 10 to Jyotirao Phule in Pune who was just 13, she continued her studies with support of her husband and the couple went on to open first school for girls at Pune in 1848 where Savitribai worked as the first teacher. She encouraged introduction of maths and science for girls at primary level. A Dalit rights activist, poet and a social reformer, her husband encouraged her to become teacher. At a time when British ruled the country and hardly encouraged education for Indians and girls were not even allowed to step out of homes, Phule dared to open school for girls and was the first teacher at school that the couple ran. When Phule would move out of home to study and teach, people would throw stones, mud at her and pass taunts but she and her husband were never discouraged. They went on to open more schools for girls. After her husband’s death, she continued his mission. In 1897, during plague break out in Pune, she opened a clinic for poor and would bring patients on her own, tendering them with her own hands. She herself contracted the disease while serving the patients and died on March 10, 1897. “After independence, politicians forgot her because her teachings were dangerous for them. Current governments can never give equal rights to Dalits and women. Neither can they digest a woman leader rising higher than men, nor can they can provide education to all — then how can Phule be their hero?” reads the board near statue with a conclusion that the best tribute to her would be continuing her mission to provide education to all. The statue has been installed for Rs 52,000 for which teachers including those from other schools in Mansa and community members contributed. “The expenditure on entire park has been Rs 1.70 lakh that too has been done without any government funds. Statue has been prepared by a Delhi firm,” says Singh. Interestingly, the government primary school Sadda Singh Wala has 128 students of which more than 70 are girls. It has seven teachers of which three women teachers are on contract getting Rs 5,000 per month salary only.